Right now the economy is growing at a frustratingly slow pace and employment gains are not strong enough to bring down the unemployment rate quickly. As we sit here today, there are two main drags on the recovery: the delayed improvement in the housing market and the public sector pullback. The housing market is not a new issue and has been and is expected to continue to be a negative factor on the recovery, or at least not a strong positive. Once the existing overhang of inventories, including some of the shadow inventory and foreclosures, are whittled down further, then the rebound in new construction can take full force and drive economic growth. Reasonable estimates of when this may occur fall in the 2014 – 2016 timeframe. The public sector pullback is a relatively new drag on the economy. Initially, largely driven by the American Recovery and Reinvestment Act of 2009, the public sector was an economic driver with increased spending on infrastructure projects, tax cuts and financial block grants to the states to shore up their budgets. Now that the vast majority of these federal monies have been spent and no further federal assistance is on the horizon, state and local governments are cutting their budgets, which leads to employment losses. 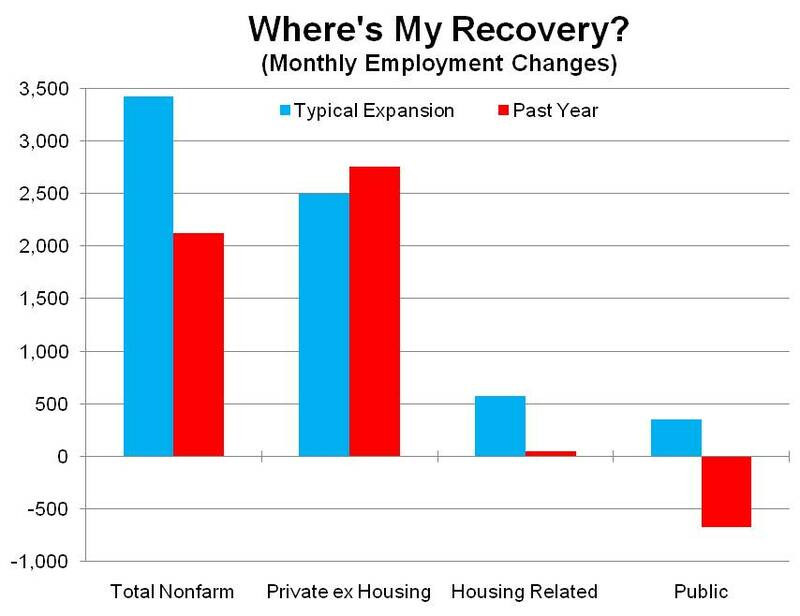 The graph below is designed to illustrate how these two main economic drags are impacting job growth in Oregon. Methodology Note: The typical expansion is defined here as the average of the 1992-1999 and 2004-2007 periods. Housing Related industries include all construction employment, building material and garden supply stores, mortgage loan brokers and real estate employees. The past year is the July 2010 to July 2011 time period. It is interesting to note that the private sector industries excluding housing are currently expanding at a slightly above average pace. That is, employment in 75 percent of all industries is growing slightly faster than the past two expansions. As for the drags, during the past two expansions, Housing Related industries in Oregon added 575 jobs per month and the public sector added 350 jobs per month. Over the past year, these same industries have only added 50 jobs per month and cut 675 jobs per month, respectively. Temporary Census employees are polluting the -675 public sector figure, however based on reports and the author’s calculations, the ex-Census figure would be -475 per month over the past year. In total, between the two drags, instead of adding a combined 925 jobs per month, these industries have actually been cutting 425 jobs per month (ex-Census), a net swing of over 1,300 jobs. If these two industries were adding jobs today like a typical expansion, total nonfarm employment in Oregon would be growing extremely well by historical standards and the unemployment rate would be declining more quickly. It typically takes approximately 1,500 jobs per month to keep the unemployment rate the same. More jobs and the rate decreases, less jobs and the rate increases. The good news in the data is the fact that total nonfarm employment is still increasing, on average, by a little more than 2,000 jobs per month and the unemployment rate has been declining over the past two years in the state, however, the improvements have not been dramatic. 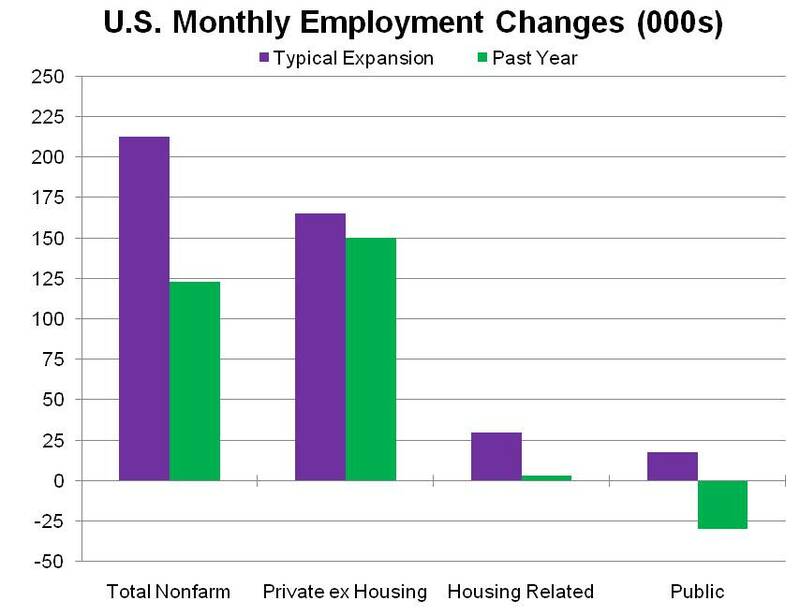 Even with this slow recovery, it is still a recovery and the labor markets are improving. For comparison purposes, the following graph illustrates the same information, but at the national level. The dates used to construct the data are slightly different than those used for Oregon, however the methodology remains the same. Obviously the same general pattern of gains can be seen at both the state (Oregon) and national level. The only real difference is the non-housing related private industries. In Oregon the growth the state is currently seeing is as strong, or stronger, than during the typical expansion, however, at the U.S. level, that growth is slightly weaker, thus bringing the total nonfarm figures down to a larger degree.